Was born in 1957 in Irbit. 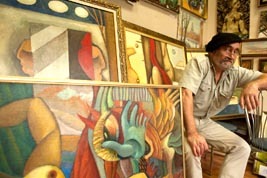 Graduated from Painting Department of the Sverdlovsk Art College in 1984. The member of "Union of Artists of Russia". Works in easel painting technique. Has taken part in many regional and city exhibitions. His works are performed in regular museum expositions of Ekaterinburg, Moscow, S.-Petersburg, Irbit and N.-Tagil cities and also in private collections in Russia and abroad.